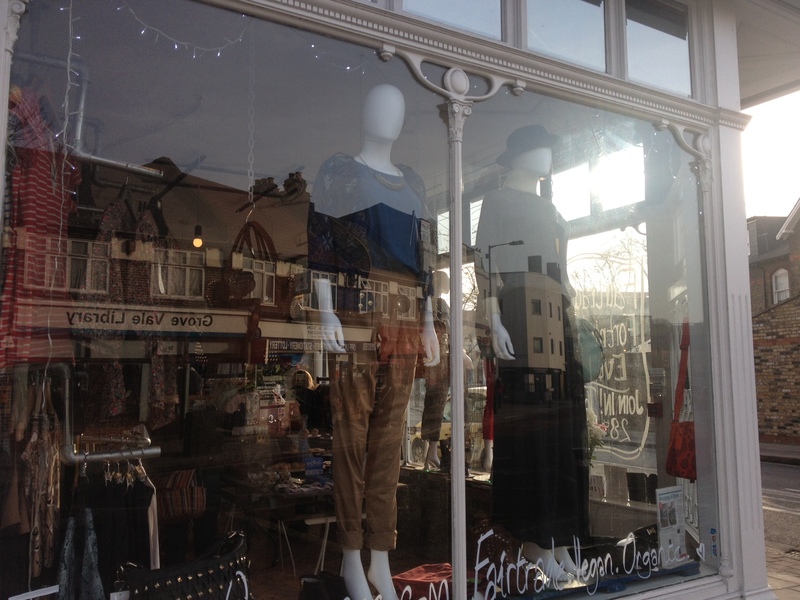 I wanted to write a post about a fantastic fashion store I stumbled across recently in East Dulwich called Fashion Conscience, on the corner of Grove Vale and Melbourne Grove. I was enticed in by the stylish accessories and items of clothing hanging in the window, and was browsing for quite a while before I realised it was an ethical clothing store… there wasn’t a hemp kaftan in sight! It just so happens that it is Fairtrade Fortnight at the moment, so I thought it was the perfect time to post this blog. There is no sign above the door so it’s easy to walk on past, but if you ever find yourself in the area I would highly recommend popping in, or even making a special trip. There are some pieces that would give Topshop a run for its money, think coloured skinny jeans, printed trousers, peplum skirts and floral shirts. And it’s not overpriced either, Fairtrade colour block peplum skirts are £49, Vegan boxy wallets are £22 and Fairtrade Fedora hats are £32. Not bad really considering what the very unethical high street equivalents would cost. The store displays are fab too, with some vintage crates, pallets and ladders all adding to the ambience. Brands include Komodo, Fair+True, Ruby Rocks and Made. Not household names but these brands offer very stylish ethical fashion, and an added benefit is that you won’t spot every other girl in town wearing the same pieces. If you can’t make it to the shop itself, you can check out their online store at www.fashion-conscience.com. I must admit that I don’t think the web design itself is up to much but don’t let this put you off, there are some very nice items of clothing and gorgeous accessories, so it’s well worth a look. Check the ‘New In’ section for the latest spring arrivals. One benefit of the website is that the online store also has a wider selection of clothing, accessories, shoes and gifts so it’s better for choice. Men are catered for online too with a decent selection of accessories and a small selection of clothing. You can use code FAIR20 online to save 20% on new arrivals for the duration of Fairtrade Fortnight.